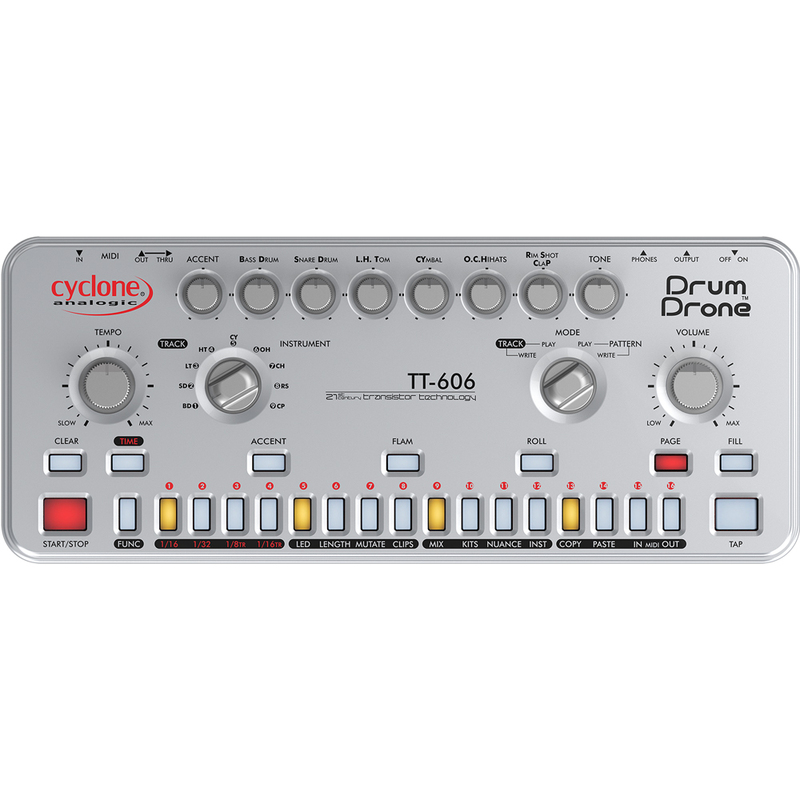 The Cyclone Analogic TT-606 Drum Drone is an inspired clone of the TR-606 Drumatix, from Roland. 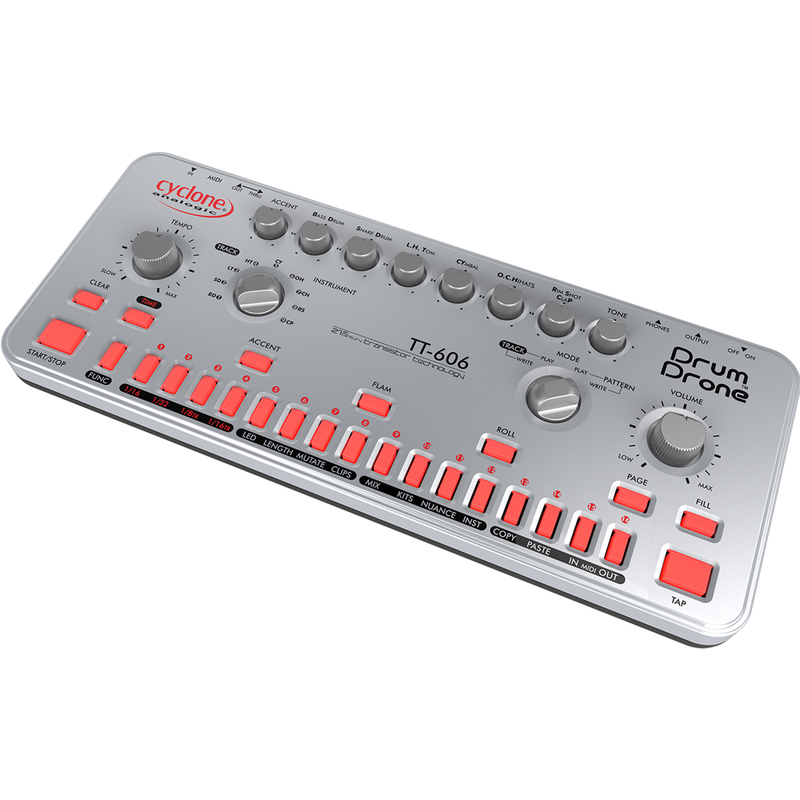 It is an analogue drum machine with the classic TR sequencer interface. 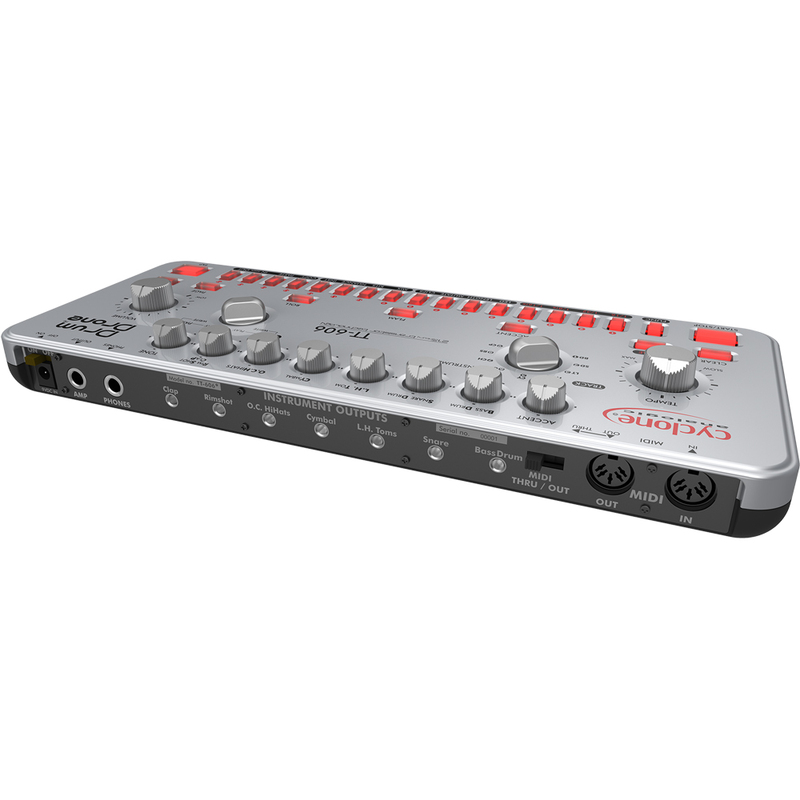 It contains individual outputs per drum sound, a useful expansion upon the original TR-606 for patching with other modern gear. MIDI In/Out, a headphone jack, and an amplifier send are also available. The TT-606 contains all the classic drum sounds from the TR, including Kick, Snare, Low and High toms, Cymbal, open and closed Hihat, Rimshot and Clap, with an adjustable parameter for each sound. Each sound has selectable Accent, Flam, and Roll tracks, for ultimate pattern sequencing. The sequencer includes multiple choices for subdivisions of the Tempo, including 1/16, 1/32, 8th note triplets, and 16th note triplets. It also has options for shuffle, all of which can be programmed in real time. 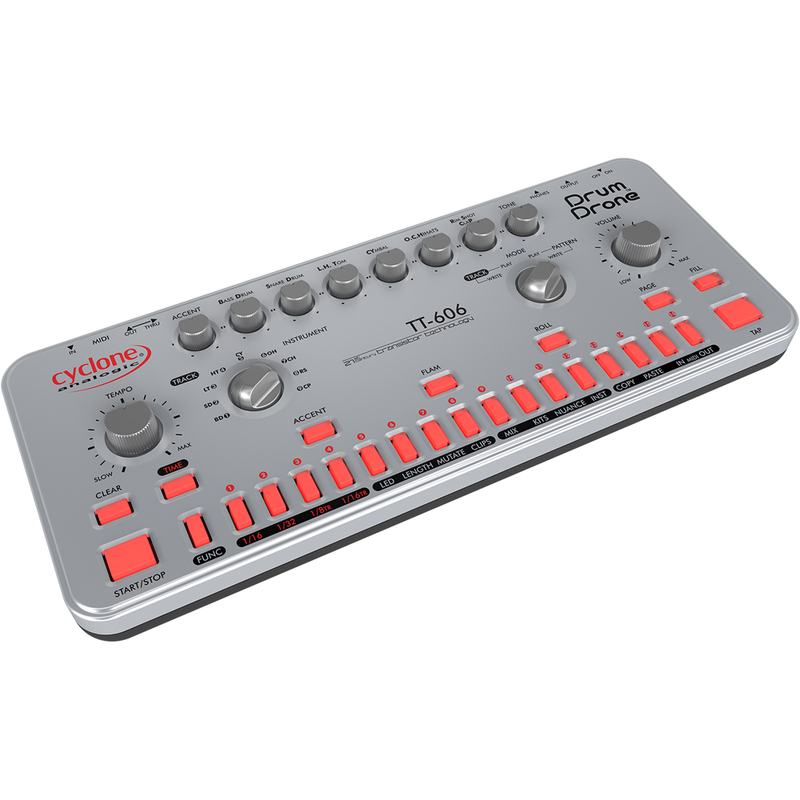 An analogue drum machine clone of the famous TR606, coming with a lot of new features and improvements, from the sound point of view as well as the ergonomics of the machine and the sequencer. 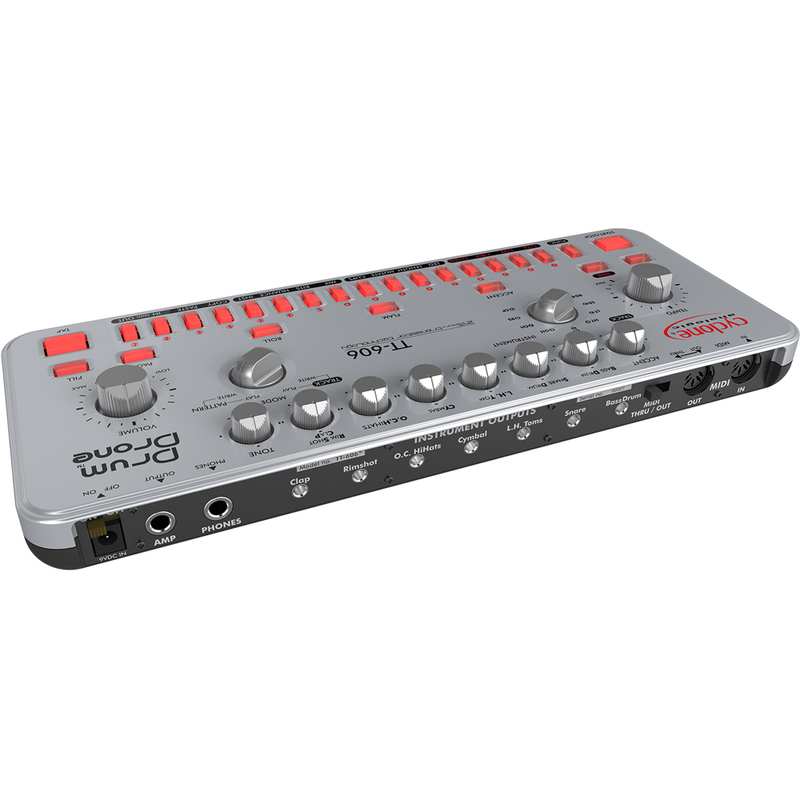 The design of the analogue circuit and the sequencer gives it a warm and groovy sound as its elder brother with much more varied sound possibilities. The very intuitive sequencer takes on the original spirit while bringing new and unique features and allows you to quickly create complex patterns and grooves while offering great flexibility for live jamming and more sound variations.